Tea-tone seedy glass lends a distinctive look to this chic, 3-light bath fixture. Add authentic industrial charm to your space with this metal and glass bathroom light. Industrial Rust finish on the piping style frame and backplate complement the tea-tone seedy glass that protects the three lights. A great addition to your home lighting decor. 23 1/4" wide x 9" high. Extends 7 1/4" from the wall. Oval backplate is 8" wide x 4 1/2" high. 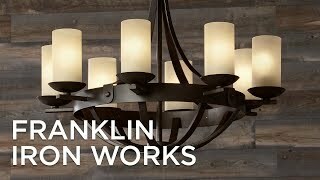 Industrial rustic farmhouse three-light bathroom wall fixture from Franklin Iron Works. Industrial rust finish over metal piping construction. Tea-tone seedy glass shades. Beautiful, but utilitarian. We are buying for cabin in the woods and this looks like it will go perfectly with the overall country/chic design. Especially love the look of the "drainpipe" design for what we are doing. This light is extremely unique in that area of design and we've searched many stores. High quality; masculine look, beautiful product and a wonderful price. Great presentation/visual on your Lamps Plus Webpage, too. THank you for having the 2 day shipping capability. We're excited about putting this in our new home. I really liked the finish! how big are the actual lamps? BEST ANSWER: Each shade measures 3 3/4" across the top x 5 1/2" across the bottom x 5" high. Can this be used above a medicine cabinet? BEST ANSWER: Hi -Sure, I do not see why not. Yes! That is exactly where I have this rustic beauty! What are the dimensions of the back plate for this bath fixture? BEST ANSWER: The backplate measures 8" wide and 4.5" in height. Its 8" wide by 4.5" high. I mounted mine on another piece of wood, and then fastened to the wall. It worked well, not sorry I bought this fixture. Does it put off good light? What bulbs are used? BEST ANSWER: Yes, I believe it puts off sufficient light for the pool bath whiere it is installed . We actually put a dimmer on this light. We used clear "Edison " type bulbs. We are very happy with this purchase . It does put off goid light, I love It! I'll need to look when I get home to get the wattage used. I have it in a powder room. Yes, this puts out good light. We used 60W clear bulbs in this fixture. Love the look of this light fixture. I purchased 2 for the home we are building to get an accurate measurement with the mirror. Love the look. goes with my shabby chic design, but updated for the 21st Century... Colors are amazing. Loved this light fixture! Style and scale were perfect for my project and the quality was of a high standard. For casual lighting in a powder room, the look is pleasing to the eye but I was expecting something a little more substantial. The glass globes are "antiqued" with paint over spray so close examination yields that its not up to par with a more expensive light where the patina is more natural. I guess at this price point it is "ok"